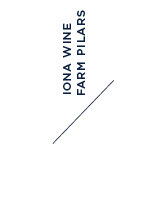 Iona is positioned a mere 4 km from the cold Atlantic and the prevailing winds that blow from the ocean over our vineyards, results in cooler days during ripening, which in turn leads to a longer hang time for the grapes on the vine resulting in more diverse and complex flavour profiles. The Iona grapes are picked at optimal ripeness. The cool climate results in low PH and excellent acidity, creating elegant, refined and balanced wines. During the ripening season the prevailing south easterly wind has a significant cooling effect on the Iona vineyards, nature’s own air conditioning system.